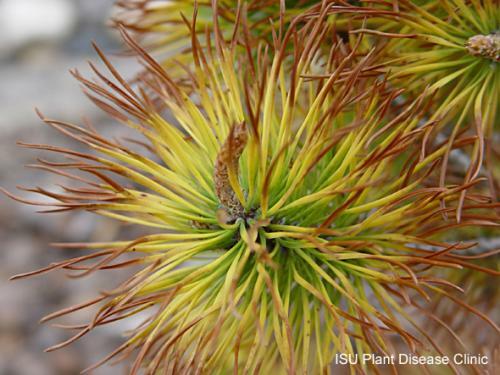 For information on winter injury please see the article "Browning of Evergreens" from Iowa State University's Horticultural and Home Pest News. The Iowa State University Plant & Insect Diagnostic Clinic can help you to investigate and confirm if your plant has this disease. Please see our website for current forms, fees, and instructions on collecting and packing samples. Contact information for each states diagnostic laboratory for U.S. residents can be located at the NPDN website. If you have a sample from outside of Iowa, please DO NOT submit it to the Plant & Insect Diagnostic Clinic without contacting us.